From towns with spectacular views of the Puget Sound to tucked-away cities with hometown charm, Pierce County is home to many small communities. Pierce County’s small communities include waterfront getaways and places with dramatic views of Mount Rainier. Pierce County is home to picturesque puget sound shorelines and panoramic views. Whether on land, at sea or beachcombing, waterfront towns are full of adventure and leisure. History buffs will revel in the old charm near water’s edge. Witness remarkable preservation in Steilacoom, the first incorporated town in Washington state . Historic landmarks and vintage storefronts guide you through the story of this former bustling frontier seaport. University Place displays jaw-dropping views of the snow-covered Olympic Mountain ranges, Mount Rainier and Puget Sound. 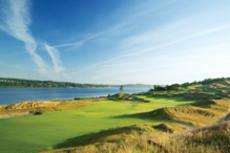 It is also the home of Chamber&apos;s Bay Golf Course, site of the 2015 U.S. Open Championships.